Dolby Atmos, the sound system which has taken theatrical audio to another level courtesy of object-based design and metadata-driven image placement, has migrated to the home, and nothing will ever sound quite the same again. By the end of 2014, you can expect to see Dolby Atmos-ready AV receivers from the majority of AV audio brands, but significantly the first to arrive comes from Onkyo. The £1,000 TX-NR838 is an upper-class proposition, strategically positioned above the brand’s TX-NR737 and entry-level Atmos-ready TX-NR636 models. It’s a seven-channel WRAT (Wide Range Amplifier Technology) design capable of delivering either extended 7.1 surround or a 5.1.2 Atmos soundstage (the last two numbers refer to the Atmos channels). As befits its price tag, the overall specification is comprehensive and it’s not short of muscle. Onkyo rates the power output at 150W ‘Dynamic’ into 8 Ohms, or 130W with all channels driven. We rate it meaty enough to drive the average room well beyond the comfort threshold. The TX-NR838 offers six rear-placed HDMI inputs and two outputs, one of which is ARC compatible, augmented by a front-facing HDMI input. The secondary Sub HDMI output can duplicate the main output for multi-zone or TV/projector use. The receiver is 4K-friendly, courtesy of four HDMI 2.0 inputs, and offers HDCP 2.2 (High-bandwidth Digital Content Protection) support on Input 3 (labelled STR/DVR), although this couldn’t be checked during the review for obvious reasons. Beneath the lid lurks a Silicon Image SiL9679 HDCP 2.2 chipset which supports 2160p up to 60 fps with 4.2.0. chroma subsampling. This would seem to be a sensible futureproofing provision by Onkyo. When you get to the loudspeaker binding posts, things get even more intriguing. In addition to the standard L/C/R terminals you’ll find Surround and Surround Back options, plus Height and Width. As this model only offers seven channels of amplification, not all can be driven at the same time; it’s up to you to choose your preferred configuration. Consequently, it’s not possible to implement a dual seven-channel and Atmos home cinema layout. The TX-NR838 is network savvy. In addition to Bluetooth, there’s Spotify with Connect, Deezer, Aupeo!, internet radio and local LAN media playback (audio only). In addition to wired Ethernet, the receiver has integrated Wi-Fi (evidenced by the two aerials on the back panel), so getting online should not prove problematic. File support is comprehensive. The TX-NR838 managed the usual selection of WAV, MP3 and FLAC codecs plus DSD .DSF 2.8MHz (aka DSD64). However, it’s the Dolby Atmos performance which is of prime interest. Short story long: Atmos is the most significant development in home theatre since the introduction of Dolby Digital 5.1, elevating the listening experience (literally) to a new level and relegating previous height and width adventures with Pro-Logic IIz and Audyssey DSX to interesting diversions. But implementing it successfully is no cakewalk. Long story short: for serious home cinemaphiles there are issues to address. 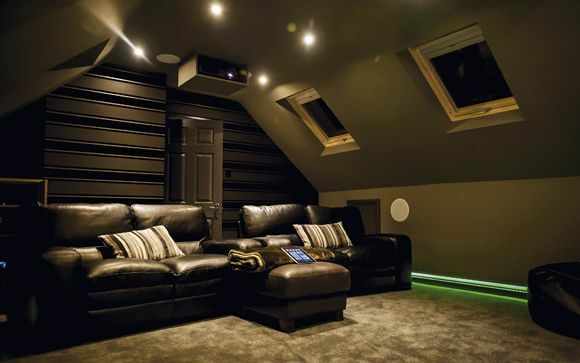 Much depends on your existing home cinema layout. My own home theatre happens to be a dedicated room with in-wall and in-ceiling loudspeakers arranged in a traditional 7.2 configuration. On paper at least, it’s a relatively straightforward task to repurpose two in-ceilings to accommodate the 5.1.2 output of the TX-NR838. In practice, though, a number of issues become apparent. Dolby Atmos-encoded software is, unsurprisingly, rather thin on the ground at present. Indeed, for this audition we had only a Dolby demonstration disc to play with. However it contains all the various theatrical idents used in Atmos cinemas (including Amaze, Leaf and Conductor), in addition to a short Red Bull F1 promo and Bailando, a dance track from Enrique Iglisias. Admittedly not a lot to go on, but these are early days. The first surprise was discovering just how much better the system sounds with reflective Dolby-enabled speakers delivering the height ambiance, compared to dedicated in-ceilings. The latter proved simply too directional, localizing the audio sent to the height channel in a way that was often distracting. While it would be presumptuous to rule out in-ceilings altogether (I suspect I’ll eventually find a subliminal output level that convinces, alternatively a 5.1.4 configuration may be more suitable), it quickly became apparent that Onkyo’s diminutive satellite SKH-410s, which the brand is packing free with the Onkyo TX-NR838 (and TX-NR737 and TX-NR636) until the end of October, were doing a better job. These up-firing speakers have an angled driver designed to bounce the height channel off the ceiling (which in my room is 2.4m), aided by some complimentary processing in the AVR. The positioning of these little boxes provides its own challenge. It’s widely envisaged that they’ll be positioned atop the front stereo pair. In my room, that wasn’t an option. However simulating the position with the little Onks on loudspeaker stands didn’t appear to work. With my prime listening position approx 4.5m away from the L/C/R, it was clear they were too distant for any sonic reflection to be effective. However, bringing these height speakers to within 2m of my listening position made a dramatic difference. The Dolby Atmos soundstage itself is quite unlike traditional 5.1. Although we talk blithely of height channels, there’s not a sense of tiered audio. Image placement is simply more realistic. The effect is not unlike wearing good headphones, albeit without the physical sensation of earcups. When a mosquito buzzes at the start of the forest clip Amaze, the insect appears to dance around your head, moving on an unpredictable vector; then an exotic bird does a complete and seamless flyaround. When the thunderstorm breaks, the LFE rumble is prodigiously deep, before rainfall appears to engulf the listening room. Leaf, the ident used to preface Brave (the first Atmos-encoded movie to be released theatrically), is similarly immersive. A twig crisply breaks to your front right, sending the titular leaf on its downward spiral; you can almost feel the air pressure as it moves around the soundstage, before landing with a deep bass ripple front left. I played these clips endlessly for days, and never stopped grinning. Sonically, the TX-NR838 is very adept. It’s capable of crisp, delicate nuance and tumultuous drama. In two-channel mode it’s surprisingly articulate, thanks in part to some lovely Burr-Brown 192 kHz/24-Bit DAC magic. It revels in unplugged sessions and light classics alike; in conventional multichannel mode it’s a rock-solid actioneer. Factor Dolby Atmos into the mix and it becomes even more extraordinary. The TX-NR838 can also upmix 5.1 content. Confusingly this process is simply labeled Dolby Surround in the menu (nomenclature decided by Dolby itself). Quite how convincing said upmixing is versus a native Atmos mix remains open to debate, although the simple expedient of using the Atmos channel with 5.1 content appears to add spatial depth to the soundstage. The only catch, of course, is that the physical arrangement I landed upon as optimum for Atmos performance is not something that would work in most homes. Having reflective height speakers positioned almost mid-room is just impractical. Conversely, I suspect that an Atmos 5.1.2 configuration in a much smaller space is not only going to work well, but will be easier to set up. Of course, I can’t vouch for what will happen if you have artex, and woe betide you if your ceiling has any sort of Atmos-killing acoustic treatment. As one of the world’s first Atmos-enabled AVRs, the TX-NR838 can rightly claim to be at the vanguard of a new era of home cinema. Even without Dolby Atmos compatibility, this Onkyo would be a formidable sonic proposition. Design, specification and performance are all impressive. However, in full immersive Atmos guise it thrills with extraordinary precision and presence. On the strength of the Onkyo TX-NR838, I predict the days of buying a non-Dolby Atmos-enabled AV receiver are drawing rapidly to a close. The future of home theatre begins here. The trick will be learning to live with it.